The epitome of beauty and brains, the Poodle is the total package. Whether your Poodle is stealing the show in the ring, working in the field as a hunting companion or reigning your heart as a family pet, this classic breed excels in all arenas. They are one of the most identifiable breeds, largely owing to their particular grooming tradition and elegance. The Poodle is believed to have originated in Germany where it was bred as a water retriever. The French have also claimed to be the home of the breed, leading many in the US to refer to them as “the French Poodle”, but this breed seems to have spread quickly throughout Europe through the 1600s-1700s. The Poodle was traded by noble sportsmen, transported with soldiers and sold by ship captains and circus performers. Their majestic beauty, intelligence for obedience training and skill in the field made the Poodle a great favorite for people of all sorts. The Kennel Club (KC) was established in 1873 and the Poodle is believed to have been among the earliest recognized breeds in 1874. The breed was later recognized by the American Kennel Club (AKC) in 1887, and is now ranked as the eighth most popular breed by the AKC. The popularity of the breed dropped in the United States between 1896 and 1931. Publicity around a particular dog reinvigorated the public interest in the Poodle. This dog, known as International Champion Duc de la Terrace, was born at La Terrace Kennels and went on to win every show in which he competed, including four Continental championships. Duc became known as International Champion Nunsoe Duc de la Terrace after he was purchased by the owner of Nunsoe Kennels in England. Duc won an English championship before being sold to the owners of the Blakeen Kennel in the United States where he won 16 groups and 9 Best in Shows and was the first Poodle to do so at Westminster. The American Kennel Club recognizes three distinct sizes of Poodles which are considered separately for show but all in the same breed. According to the breed standard, the Standard Poodle measures over 15 inches at the shoulder. Miniature Poodles must be over 10 inches and up to 15 inches, also measured from the floor to shoulder. The Toy Poodle must measure 10 inches or less. The length of his body from shoulders to rear should equal the height from the ground to the top of the shoulders. Without a doubt the most recognizable attribute of the Poodle is, of course, his coat. The Poodle’s coat is naturally dense and curly. You may be most familiar with the fluffy brushed out texture of a Poodle coat, however, corded texture (think of this as a Poodle with really great dreadlocks!) is also acceptable. The corded Poodle was popular in the 1800s though a quick internet search will show that there is a modern movement to revive the corded coat trend. 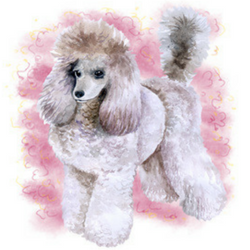 In addition to the texture of the coat, the cut or clip of the hair is also pretty unique for the Poodle. 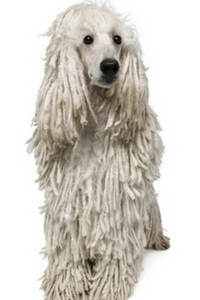 Whether corded or curly, the traditional clips are the same by AKC standards. Dogs under one year may be shown in the “Puppy” clip where the coat is left long or just trimmed to give an overall symmetrical appearance. The face, throat, feet and the base of the tail are shaved in all clips to highlight the Poodle’s elegant features. The “English Saddle” clip is where we start to get fancy with also shaving part of the front legs leaving puffs just above the front feet. The hindquarters are clipped short with two shaved bands on the hind legs. The rest of the body is kept long and fluffed or corded with the signature “pompon” on the tip of the tail. The “Continental” clip is even more elaborate. The hindquarters are shaved save for “bracelets” on the rear legs and optional pom-poms on the hips. Like the saddle clip, the rest of the coat is left full along with the tail pom-pom and foreleg puffs. These stylish puffs and pompons on the Poodle are not just decorative. These clips originated when Poodles were predominately used as water retrievers by duck hunters. The hindquarters were shaved to provide easier movement while the pompons serve to insulate the joints, and the full coat on the chest adds buoyancy and warmth. Poodles are a colorful breed, though, solid colors are preferred for shows. The ten standard colors include apricot, black, blue, brown, cream, gray, red, silver, silver beige and white. According to the AKC standard, parti-colored dogs, where the skin is of two or more colors, would be disqualified from competition. Based on what I have shared about the Poodle’s coat, you may have guessed that the Poodle requires extensive grooming. Your Poodle’s coat will require daily attention; especially if they are kept in one of the competition clips listed above. Poodles have hair, similar to humans, that doesn’t stop growing rather than fur. This is what keeps the shedding and allergens low; one of the most attractive features of the Poodle. Poodles are prone to developing matts in their coat. To prevent matting it is important to keep your Poodle clean and to brush him daily. Brushing his coat when it is dry or dirty could break and damage the hair. The recommended technique is to use a pin brush after bathing or to mist the hair prior to brushing. The hair should be brushed from the ends toward the skin to make tangles easier to work out. Brushing should be followed by combing to ensure that all tangles and matts are eliminated. Line brushing will help you to thoroughly brush your dog while keeping him comfortable. Line Brushing: Have your dog lay on his side. Using a pin brush or rake, part the coat lengthwise down the body at either side of the spine. Mist the coat and brush against direction of hair growth, or towards the head. Repeat these steps moving in small sections down both sides of the dog. Caring for a corded coat may seem easier as no brushing is required and the coat will often naturally begin to cord if it is allowed to air dry. However, it is more difficult to keep a corded coat clean and dry. Debris in the coat must be manually removed to prevent damaging or breaking the cord. Thoroughly drying the coat will prevent mildew and odor development. There are forums and YouTube videos available online that offer tips and tricks for cording your Poodle’s coat. Cording begins as the coat transitions from puppy fur to adult hair, usually around 7-9 months of age. As the lighter fur is shed it tangles or matts within the growing hair. In some cases, these will naturally form cords, though, it is often necessary to gently pull the matts apart by hand to separate them in to manageable sized cords. Keeping them clean is critical to really attractive cords, and of course, no brushing! Poodles are well known for their elegant, regal air, however, they are just as loving and eager-to-please as other highly intelligent breeds. Their even temperament is one of the reasons that Poodles are so often bred with other dog breeds to impart desirable characteristics. Poodles are not known for aggression or excessive barking, and are extremely adaptable to nearly any environment. They prefer to be around their humans making them ideal companions, but are prone to separation anxiety if not properly trained. Loyal and smart, the Poodle is one of the easiest to train breeds. The Poodle is able to excel in agility, conformation and hunting, but they are also trained for search and rescue work and as assistance or therapy dogs. As with other intelligent breeds, Poodles are prone to boredom if they are not given appropriate training and activity. Training should begin early and be consistent to ensure your Poodle doesn’t develop poor habits such as separation anxiety. The Standard Poodle is listed as one of the operational search and rescue breeds by the American Rescue Dog Association (ARDA). The qualities that the ARDA looks for in a rescue dog include excellent scenting capability, strong drives (prey, pack, play, etc. ), physical endurance/stamina, high degree of intelligence and a high degree of trainability. Standard Poodles are the preferred size for this type of work because of their size and agility. Some Miniature Poodles can serve in the search and rescue function as well for their ability to fit in small spaces. Miniature and Toy Poodles are well suited for most of the jobs that Standard Poodles are capable of, but truly shine as therapy dogs and agility competitors. These smaller Poodles are also ideal performers; and all three sizes have been taught intricate tricks throughout history, including being regular attractions at the circus. If you are looking for a well-mannered and eager-to-please companion, the Standard, Miniature or Toy Poodle might be the right fit for your home. All three sizes of Poodles are considered generally healthy, but they are prone to some common health concerns. Some issues such as hip dysplasia and eye diseases, like cataracts and progressive retinal atrophy (PRA), are prevalent in several breeds. Other diseases, such as Addison’s disease, are more common in Poodles than other breeds, specifically in the Standard Poodle. Miniature and Toy Poodles are more prone to orthopedic issues, such as Legg-Perthes and patellar luxation, than Standard Poodles. The first step to ensuring that your Poodle is healthy is to use a reputable breeder when purchasing your puppy. 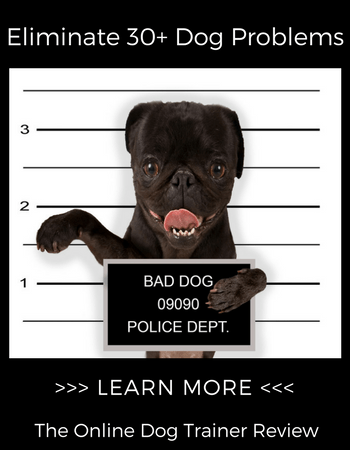 AKC approved breeders conduct genetic testing on their dogs to promote healthy puppies. Regular visits with your vet can help to identify these issues early and increase the likelihood of successful treatment. For your part, it is best to keep your Poodle at a healthy weight by providing sufficient exercise and a healthy diet. This can significantly lower the risk of hip dysplasia and luxation of the patella. Ready to Purchase Your Poodle? If you have decided that the Poodle will be the next King or Queen of your home, you want to start with the best breeder you can find. 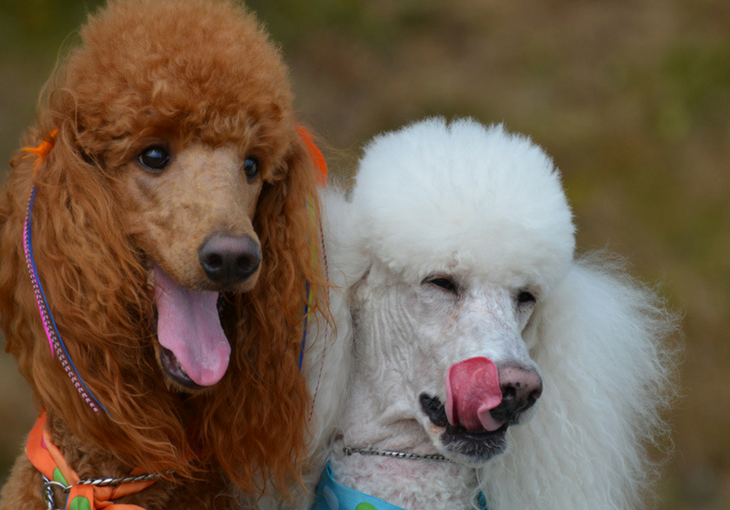 The AKC and the Poodle Club of America (PCA) offer search tools to help you locate breeders and rescue organizations specializing in Poodles. The cost for a Poodle can vary greatly depending on your location, the size of the dog and the reputation of the breeder. Researching the puppies available from the AKC approved breeders, we have found prices between $1000 and $2500. If you are not concerned with full AKC registration, you may want to consider rescuing your Poodle. This option is far less expensive and these dogs are given all necessary veterinary care prior to adoption. Dogs adopted from the PCA rescue organization are kept in foster homes and are socialized, but don’t typically receive any official obedience training. Rescue is also a great option for people looking for an older dog that will likely already be housebroken and well mannered. The Poodle has been winning the hearts of their human companions for hundreds of years. A favorite of royalty, like Louis XIV and Marie Antoinette, the Poodle has an influential fan club. Poodles are celebrated in print and memorialized on canvas by their famous owners, such as John Steinbeck’s best seller “Travels with Charley” about his beloved Poodle. Winston Churchill, UK Prime Minister 1940-1945, 1951-1955, was an avid animal lover and inseparable friends with his Poodle, Rufus. The Poodle’s intelligence, loyalty and temperament make him an obvious choice for any owner. However, breed specific traits, like low shedding and being tolerated well by people with allergies, make him well suited to homes that would not be successful with other breeds. In addition to his low-shed/low-allergen coat, intelligence and temperament, I think that versatility is what makes the Poodle so popular with such a diverse group of owners. The range of sizes means that whether you want a dog to put to work, like for hunting or search and rescue, or you are looking for a tiny lap dog; you can find a Poodle to suit your lifestyle. Prospective owners must be aware of the training and, perhaps more important, grooming commitment they are taking on when buying a Poodle. With these things in mind, and the relatively long lifespan of the Poodle, this majestic and loyal guy can bring your family years of love and happiness.